Updated! 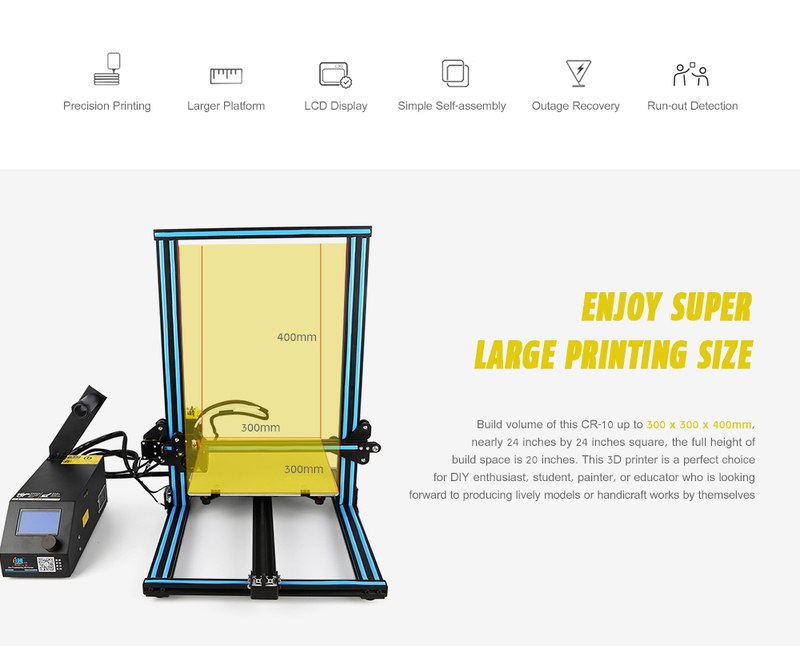 !This is newly updated CR-10S ! 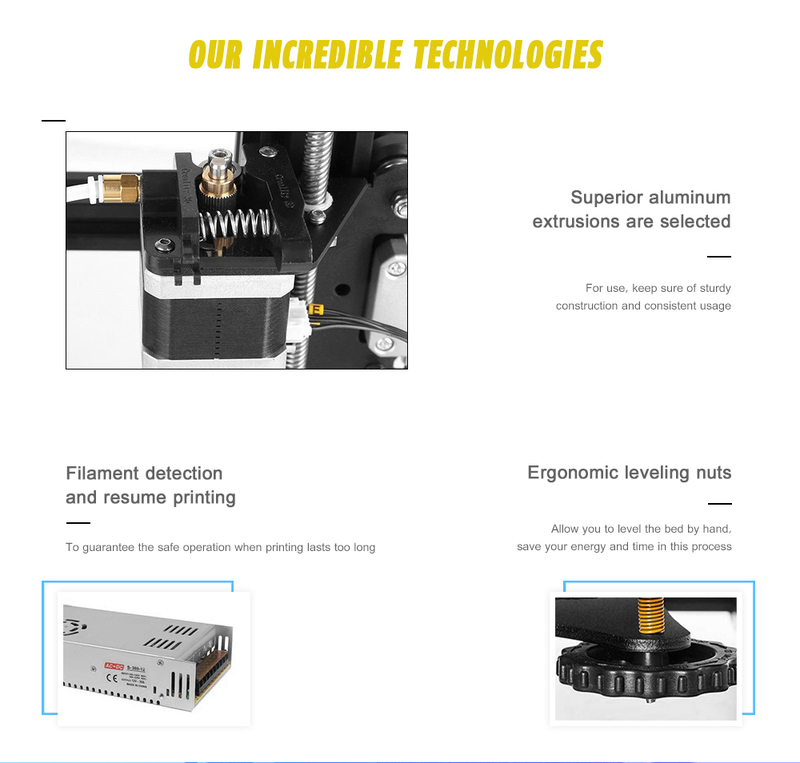 The difference between CR-10 and CR-10S is CR-10S upgraded with dual Z axies lead screw rod which make printing quality better and more stable. Another upgrading is CR-10S mainboard with filament monitor function, this function can detect when filament is running out or not. Printing Size ： 300*300*400mm or 11.8"x11.8"x15.8"
Notice: If you have any questions or problem, please feel free to contact us, we will do our best to help you. I thinks it’s a really nice product, I have been enjoying myself. Hi, Both z axis lead screw retaining nuts where all loose and one missing. x axis rail rollers way too tight axis could not move, had to adjust , little dent on one wheel now. a few other loose nuts the control was set to 220v many molded parts included and new upgrades here and there that i appreciate a lot. Nothing had to be printed out to be ready working. Very well packaged nothing missing. print quality is way better than i expected. I am very satisfied. Great printer! Takes some time to learn the basics but the proces itself is satisfying. Quick delivery, good results. Very good printer , easy to install . Surprisingly well put together, did not need any serious adjustments, alignment, or troubleshooting. Assembled and Printing within an hour. Honestly surprised at quality and rigidity of printer. Only major issue was with dual z-axis alignment. I am very impressed with this as a first 3d Printer. This a great way to starting to learn with 3D printing. A well working and great 3d printer. Assembly was easy and did not take long. I do recommend to by the cable extension kit with this since the cables are only long enough to place the controll box on the left side. If you want it on the right side or anywhere else the cables are too short. Very happy with this printer. This is my first 3d printer and I'm glad I went with this one instead of the other(cheaper) ones I was looking at. Still learning but I know this one will do most things I want to do and then some. So I bought this knowing there are about $150 worth of upgrades needed to make this baby run right. It needed an upgraded hot end (microswiss), an upgraded feed block (aluminum), and a heat pad (120V). At first, the bowden tube was not far enough down to the nozzle, so it jammed. With that fixed, I moved on to leveling the Z axis with calipers. I then ran a 30x30x15mm test cube which printed perfect (using Simplify3D slicing software, which is a must in my view, $150). It printed perfect within 40um in all axes. As the prints grew in X and Y, they would peel up, and the head would drag them off. This is due to the bed being 10C or more different outside of where the heat is, which is in the center. All in all, I am pleased with the purchase, but know it is not for the novice, or an "out of the box" printer (for that I have a QIDI). Great printer. Horrible instructions, but you can get help online very easy. Also, for the FB people there is a group that will help you. I have done a dozen prints so far. One was 20 hours and did great. However, the catcode that comes with the printer only worked one time printing. Now this particular code fails every time. I am not sure why because my drawings are doing fine. Setup time is about an hour. Of course, some will be quicker and some slower depending on your skill set. The tape that came with the unit works really good for printing on. I just tried blue tape, because that is what you will be told to look for, however, it does not work for me. Several prints have pulled away from the blue tape. I am not sure why because I have tried several different bed temps. So, I am going back to the yellow masking tape. Some users use glue. I found that more to clean up, but it does work. If I was just learning again, I would start printing small cubes and experience what happens with resolution. Cura is the software I am using for my print setup. It is a good program to use to change printing details and adjust location of the prints on the bed. Just make sure you add your printer make to it so the attributes are set up correctly. Finally, I use Fusion360 for all my drawing. I love Fusion360. It is an Autodesk product and I think they are the leaders in drawing software. Plus Fusion360 is free I think. Good luck with your prints!! I have included some pics of stuff I did so far and one video. I ordered not noticing the .shop domain I then googled it and found a nasty reddit thread with some very unhappy customers. Well my experience turned out to be the exact opposite customer service emailed me back at midnight EST and did offer to refund my purchase but I gave them a shot since they claimed the item was to be shipped from the US with only a 7 day ship time which is the same it takes to file a claim with Paypal well the printer showed up on time the tracking number did work correctly also the box was in prefect condition no shipping damage at all. The printer has been running almost non stop since setting it up. If its your first printer be prepaired to do some research its not the easiest thing to get up and running the first time but once you figure it out you could setup another one in 15 minutes. From my experience Id recomend you give them a shot and probably pay with PayPal just to be safe. My third print was the biggest one I've done and it ran flawless with no problems for forty hrs straight . So far it has been a great 3D printer for my first 3d printer purchase. I believe this is partially because I spent a good hour making sure the frame was square using a carpenters square on the X gantry and Z towers before I began bed leveling. The original glass wasn't close to flat, it was high in the center. I replaced this before any printing was done with the 12"x 12" mirrors from Home Depot. My first print of a pumpkin off of Thingiverse was pretty much perfect aside from forgetting to check the box for Add Supports in Cura. Since then I've run about 50 hours of prints without a printer related issue, the only issues I've had are with the most recent update to Cura creating some buggy g-code sending the nozzle way off of the print and back to it creating stringy loops of material 5-6 times a print. I was surprised to see that my CR10S shipped with a couple of modifications that a lot of the CR10/CR10s community was saying needed to be printed ASAP such as oversized bed leveling knobs on the heat bed to make bed leveling easier and strain relief for the heat bed wiring. I do however wish the heat bed wiring was a bit longer, it's definitely the shortest cable of all of the harnesses. Printer is awesome, quick assembly, very high print quality. Frame is sturdy and with some minor upgrades that I print myself it become my number one choice. Very recomended. I love this printer! everything works great! Good 3d printer. good value for money. Strongly recommended. Top-shelf printer at a great price. 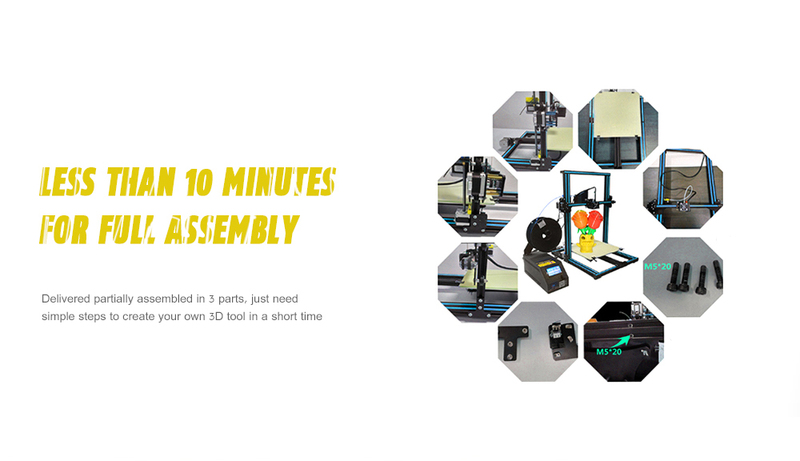 If you're after a first printer, this one is a must. 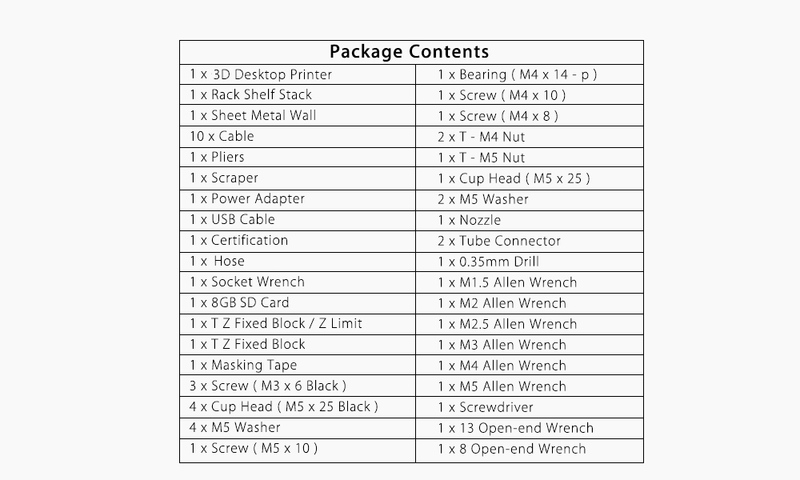 printer received, very well packed there is even the tools that one needs I do not regret my purchase. quite the contrary !!!!!!!!!!!!!!! I am very satisfied with my printer, it works in a very precise way. A very good printer for his price. Good quality. Great print from the get go. Did a calibration cube, awesome and accurate, did a statue, flawless. Left it doing a 25 hour long print, not an issue. This is one of the best 3D printers you will ever get. mine arrived in good shape. assembly was super easy and it works like a charm. its a workhorse and can work day and night without any breaks. 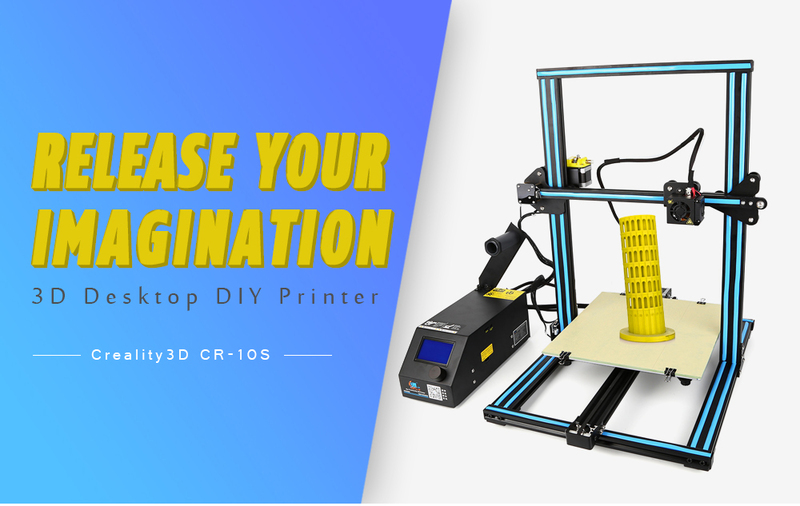 if you are starting your 3D printing career, do not think, just get CR10S and you will love it. Ordered it as a backup for my CR-10 S4. Took about 20-30 minutes to put together and discovered I had a warped glass plate. Not docking a star for that since I knew going into the purchase I'd likely receive a warped glass plate. Took a bit longer than normal to level the bed and tram the print head due to the warped plate but within 60 minutes of opening the box I started a 14hr print which finished beautifully...on the warped glass plate, no less. Tips: The positioning of the spool holder is atrocious and will cause the control box to tip over into the printer the first time the printer encounters a kink in the filament. Re-locate the spool to the top crossbar and print the feed guide from thingiverse and you wont run into that issue any longer. Print a replacement for the control knob on the control box. Print larger bed leveling thumbscrews (available on thingiverse) to make leveling the bed FAR easier. Mark 100mm of filament from the filament out sensor to the spool, then use the control box to preheat the extruder and extrude 100mm of filament. 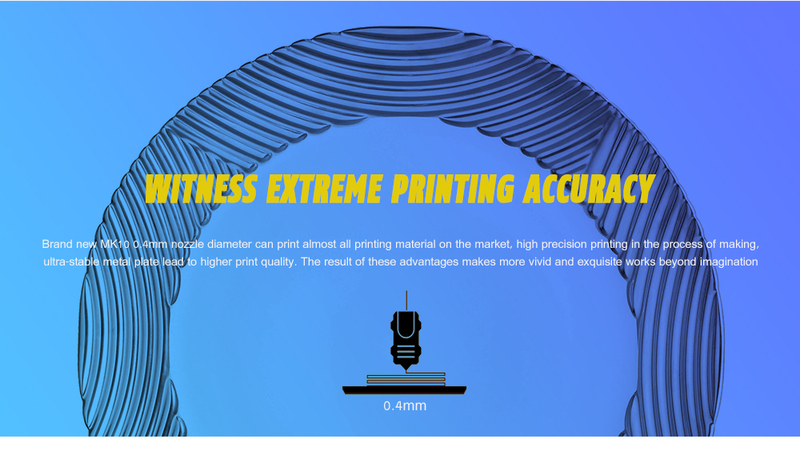 If the 100mm mark on the filament does not reach the hole on the filament out sensor, you are under-extruding and you will need to adjust your slicer settings. Awesome 3D printer. Having the huge print volume is a game changer compared to my Printbot Play. One thing to note and maybe its the same with all printers but with this one you have to re-level the machine before every print. Just the act of putting pressure on the glass to remove prior prints is enough to get it out of level.n Otherwise great printer! Aboustly the easiest and best printer I've ever used. I've got 600 hours on it and it's going strong, I suggest adding nema 17 stepper steel and rubber dampners on it to make it quiet also to upgrade the fans in the control box to noctua fans other than that the wiring and quality is fantastic. Also the heated bed comes with a mosfet running it already in the contorl assembly. Works great right of the box, setting it up wasn't difficult by any stretch, but it was harder than I anticipated. Youtube is your friend. Took over 30 min to assemble, but I'm ok with that. was simple to put together after figuring out how the pieces were supposed to set. The instructions where not very clear. Will update review at a later date after I have a chance to print out something. Would be a great printer, had it not been shipped with a heated build plate that had bad soldering that shorted it out. Needless to say the build no longer works. Product shipped quickly and arrived in great shape. Assembly and set-up were quick and easy. First 3D printer and perfect! Couldn't ask for more of a walk through from beginning to end with the instructions. I might just have to buy the bigger bed! Takes a while to get the hang of but once you know what you're doing this printer delivers excellent quality prints.